Many locals prefer to take ETS train to KL for its convenience and the comfort that it offers. Locals usually use the train service to KL to go back and forth from their hometown on weekends or public holidays. Hence, train tickets to KL can be sold out fast during public holiday. Kuala Lumpur or KL is the capital city of Malaysia, one of the busiest metropolises in Asia. Apart from being one of the top attractions in Malaysia, Kuala Lumpur is also the center of economic growth in Malaysia. The huge job opportunities available in KL draw people from the other states to Kuala Lumpur to work. The duration and the fares for the ETS train ticket to KL differ based on the departure point and the type of train you choose. 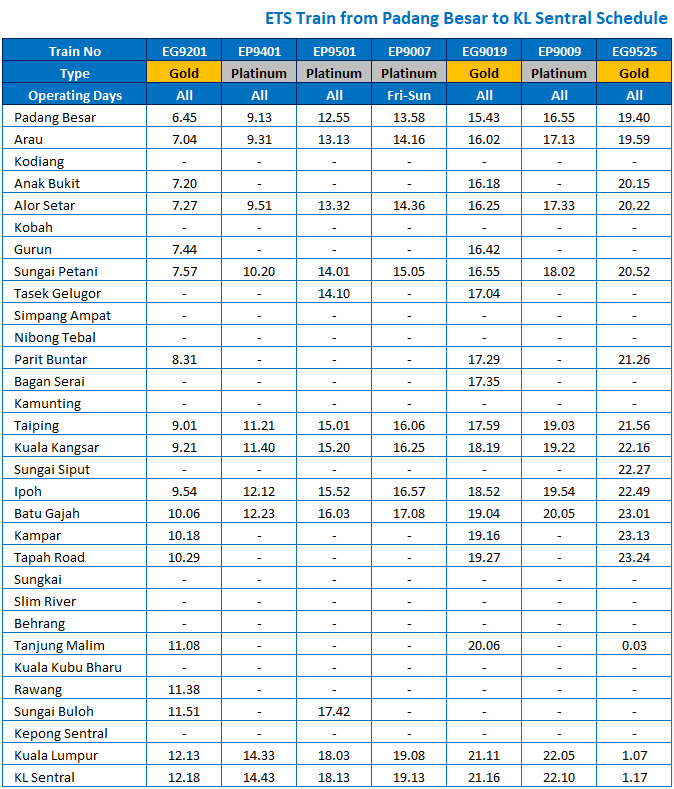 Here are some of the popular train to KL, the estimated duration and fares. ETS Silver – stop at all stops, hence taking slightly longer time. ETS Gold – have fewer stops compared to ETS Silver. ETS Platinum – have the least stops, complimentary snacks is served on board. ETS train schedule is arranged into three different routes. ETS train to Kuala Lumpur is available in all three routes; KL Sentral-Ipoh-KL Sentral, Gemas-Butterworth-Gemas and Gemas-Padang Besar-Gemas. Click here to see ETS train schedule from Ipoh to KL Sentral route, valid from 1st August 2017. Click here to see ETS train schedule from Butterworth to KL Sentral route, valid from 1st August 2017. 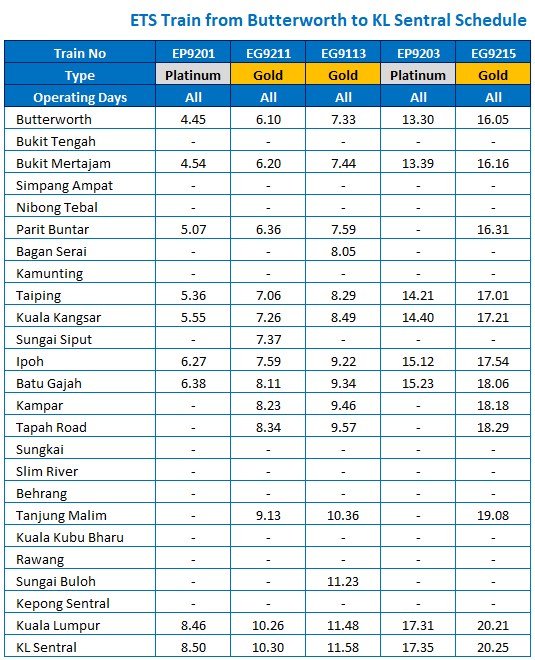 Click here to see ETS train schedule from Padang Besar to KL Sentral route, valid from 1st August 2017. Usually, ETS train to KL will terminate in KL Sentral, Kuala Lumpur. KL Sentral is the transportation hub in Kuala Lumpur located at the center of the city. Once you reach KL Sentral, you do not have to worry on how to get to your next destinations, as there are many options of transportation to choose. Some of the options include express bus, city bus, taxi, LRT, KLIA Transit and KTM trains. KL Sentral also has complete facilities. Washroom, restaurants, surau and shopping mall called Nu Sentral are all available in KL Sentral. Since KL Sentral is usually crowded, please take care of your belongings and beware of pickpockets. The train is comfortable and suitable to facilitate senior citizens and OKU.